Whales are social animals. They swim together, hunt together and whistle along. Sometimes, they even get lost together. If they’re lucky, a wrong turn results in only mild confusion. 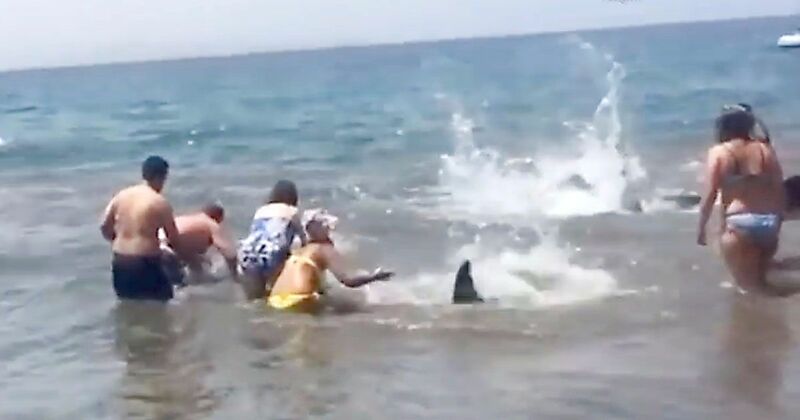 If they accidentally move on to the shore, however, what would have been a silly mistake can become a fatal error. That is what almost happened to a pod of short-finned pilot whales last week. The disoriented whales swam up towards the shore in front of hotel Sandos Papagayo in Lanzarote. Many of the confused mammals began beaching themselves. Luckily, help was nearby. People of all ages and nationalities ran to their rescue. Tourists at the beach coordinated together, working two or three people per whale to get these little guys back to the sea. Once the whales were on their way, people in the crowd splashed at them to keep them headed in the right direction. Others swam alongside the whales to ensure they made it to safety. Mass beachings are not as unusual as one might think. Some believe military sonar is the culprit. Sonar adds man-made noise to the ocean and may make it difficult for whales to use echolocation. This would leave them blind since echolocation is how many whales see and communicate underwater. Studies conducted to identify whale responses to sonar have repeatedly shown them rapidly swimming away from the noise. Some whales are even thought to surface too quickly as a method of escape, dying in the process. It is hard to know whether sonar was involved in this incident. Some people who know the area believe that boats were the problem. As one Youtube user commented: “The Faroese drive the pilot whales into bays with dinghies and boat every year, so maybe the boats and dinghies trailing them had something to do with them swimming ashore?” Other sources claim it was just a trick of the tide that day. Short-finned pilot whales have been involved in mass beaching before, leaving scientists questioning what went wrong. 143 whales beached themselves in 1973 and another 81 beached in India last year. Luckily, this week’s story had a happy ending.